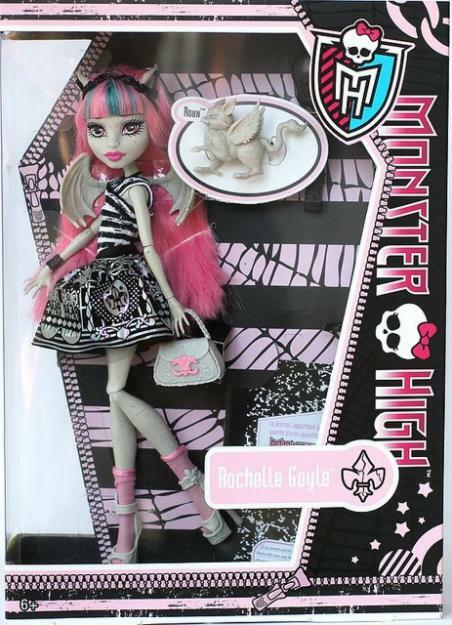 Aquí os traigo una de las últimas Monster High en llegar a España: Rochelle Goyle, ¡de piedra me he quedado! jaja! Rochelle es hija de gárgolas. Odia la natación ya que se hunde cual piedra pero es muy protectora con sus amigos. Rochelle viene con accesorios y su mascota, una gárgola. Monster High Rochelle Goyle Doll: The Monster High student body continues to grrr-ow with four new ghouls enrolling this year. Like her fellow classmates, the Parisian-inspired Rochelle Goyle doll has a signature style with lots of scary cool details and an ancient monster heritage. Rochelle Goyle is the daughter of the infamous Gargoyles. Rochelle would also be lost without his best friend and sidekick, Roux, a lovable and loyal gargoyle griffin. Because she’s shy, she can sometimes seem like she has a chip on her shoulder, but she’s actually a loyal friend with a rock-solid fashion sense. She wears a black-and-white outfit with silvery accents and bold accessories and comes with her gargoyle griffin named, Roux, diary, doll stand, and brush. The teenage children of the legendary monster menaces have gathered together under one roof to attend high school at Monster High. These ghouls are wild, they're fierce and they're totally trendy. They've left their parents' outdated haunting habits behind to form a killer style all their own. Collect all your favorite Monster High Dolls! Each doll sold separately.